Help, My Baby Won’t Sleep! When Do Babies Eat Baby Food? How Do Babies Get Ear Infections? As a parent of one toddler and a newborn (on 9/19/2018), I always find myself putting WAY too much time into researching things before I buy them. My wife suggested I take some of that hard work and put it into written form for the world to enjoy, hence SnugBaby.net was created! Help! My Newborn Won’t Sleep at Night! How Do Babies Get Thrush And How Is It Treated? Top 10 Last Minute Christmas Gifts For The Toddler Mom or Dad in Your Life! Why Is My Baby Crying? How Can I Soothe Him or Her? ​Check out Amazon's Top ​​Rated Strollers for Infants & Toddlers! In this article, we review what we feel are the Best Double Strollers for Infants and Toddlers. As parents of a (now) 3 year old, and a new one here – this is something we researched like CRAZY before our first was even born! 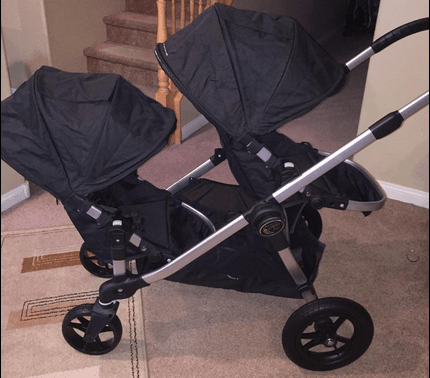 These 9 Double Strollers are a great option not just for families that already have two small babies, but also for those that have one kid but are planning for another one soon. Double strollers can be great for daycare centers and babysitters too. Double strollers are available in a wide variety of designs that cater to different needs, preferences and budgets. This is the EXACT one that we use in my family and all I can say is that it’s phenomenal. I simply cannot say enough good things about it. The key features of this are ‘flexibility’ and ‘versatility’. There’s so much that you can do with this model. You can set the 4 point reclining seats to the forward facing, parent facing or sibling facing position. Actually, the seats can be arranged in up to sixteen different combinations if you intend to get additional accessories such as the car seats, bassinet kits etc. Each seat of the City Select Double Stroller car seats can hold up to 45 pounds; this means that I don’t have to worry about upgrading to a bigger, sturdier model as my kids grow up. It folds easily and is fairly easy to steer. I appreciate the thought that has been put into this model. The front wheels can be set to swivel or lock. I choose swivel if I am going over minor obstacles as this makes it easy to maneuver. However, if I want to go in a straight line, I just lock the front wheels and hence, it doesn’t wander about like many other double strollers that have a mind of their own. Let’s take a quick look at its features. 2) Padded seats are very comfortable and have multi-position foot wells. My son loves his rides in ours. Front wheel suspension filters out most small bumps. 3) Comes with a hand-operated parking brake on the handle. Very convenient and safe. 4) The 8 inch front wheels and 12 inch rear forever-air wheels help it to go over most obstacles that the city throws at it. 5) Both seats have a UPF 50+ canopy to keep out the bright Californian Sun. 7) Haven’t had to reach out to customer service but have heard only good things from friends. Baby Jogger has been around since 1984. That’s almost 35 years in the childcare business. They must be doing something right! 8) Compact size – you don’t need a large SUV to carry this one around. A large hatchback or a compact crossover will do the job. 9) As my wife says, "it looks insanely cute!" I'm trying to remain objective here but can’t help noticing its good looks. Also, it is available in not just 2 or 3 but 10 colors. 10) Good overall build quality. Hasn’t given us trouble even once. 1) Not suitable for babies younger than 6 months of age. 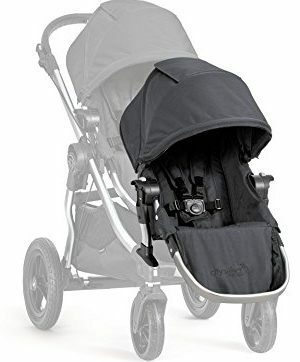 BUT - This issue can be resolved by attaching a Baby Jogger Travel System set up, which works as a car seat and moves effortlessly between your car and the stroller. Basically, you can use this onr from birth until they no longer need one, with a few simple attachments. It's not the cheapest double stroller around, but it's one of the best and should last you for years. Overall, I love this and am happy to say that it gets the ‘SNUGBABY’ seal of approval. A big thumbs up to Baby Jogger for coming up with such a wonderful product. As the name suggests, this model has a two seats plus a platform at the rear for one of the kids to stand or sit on. The platform adds a little something and injects a dose of fun to get the kids excited about going out. It has a functional inline design with just enough storage space. Each seat and the platform can hold a child weighing up to 40 pounds. The Sit and Stand impresses with its long list of features that make life just a little bit easier for parents/caregivers. 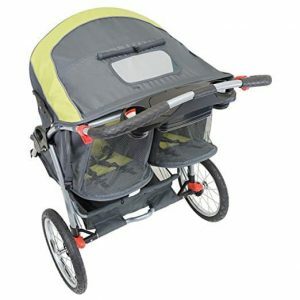 1) Suitable Double Stroller for two kids of the same age or of slightly different ages. The rear seat (and canopy) can be removed to make room for the older kid to sit or stand on the given platforms. This one grows up with your family. 2) Both seats have canopies to shield against harsh sunlight. 3) Seats have removable child trays plus a covered parent tray for things like keys, phone, treats, drinks etc. Both child and parent trays include cup holders. There’s also a sizable storage area under the seats for kids’ supplies. 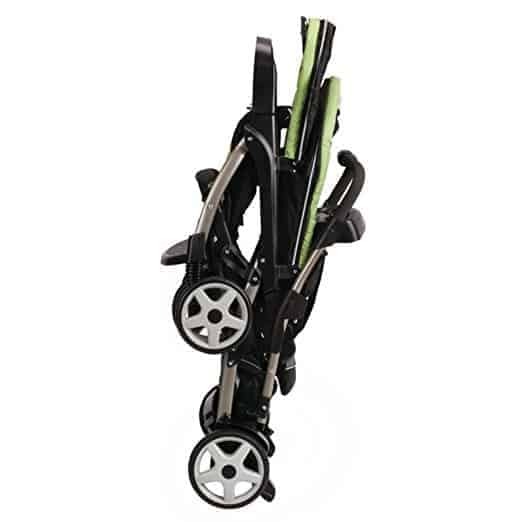 These double strollers help immensely when you are out and about with two kids. 4) It's compatible with two Baby Trend car seats. However, you’ll have to buy these separately. 5) Has a sturdy metal frame. This makes it just a tad heavy but it is easy to steer and can be folded easily. In fact, Baby Trend claims that it can be folded with just one hand. Tires provide good traction and enable it to turn on both smooth and rough surfaces. 6) Extremely competitive pricing. Mind boggling value for money! Plus you can add a 2 or 3 year protection plan for the price of a couple cups of coffee. 7) Five point seat belts and foot brake. 2) The seats could have had more padding. 3) A little bulky (but narrow enough to go through standard doors). Exact dimensions L x W x H: 49 x 21.5 x 43 inches. Overall, the Sit and Stand is a very good model at a bargain price. It has all the bells and whistles too! When it comes to Double Strollers, This one is PERFECT for growing families. It offers lots of possibilities in terms of seating arrangement. It can accommodate two removable seats one behind the other. If one of the children is older, he or she can sit or stand in the rear. The rear seat can be removed to reveal a padded platform (acts as a jump-seat) and another platform to stand upon or to place feet when seated. Often, older children are not very enthusiastic about getting into a conventional seat. Kids, by their very nature are quite playful – they want to sit this minute, then stand after 5 minutes. They feel like strolling around for a bit and get tired and want to take a seat again. The Sit and Stand Ultra caters to these requests. It fact, it does a lot more than that. Let us find out. 1) It can accomdate one or two Baby Trend car seats. However, you’ll have to buy these separately. 2) It can take two children weighing up to 50 pounds each. 3) The nylon seats feature a fold-able and removable child tray and secure, 5 point seat-belts. 4) It has cup-holders for both kids and parents. There’s also a separate covered parent tray near the handle that has space for grown-up stuff like keys, mobile phones etc. 5) Removable canopies protect against Sunlight. Large storage basket at the bottom. 6) Front wheel suspension offers a decent ride. 8) A boon for budget-conscious buyers. Very well priced for what it offers. 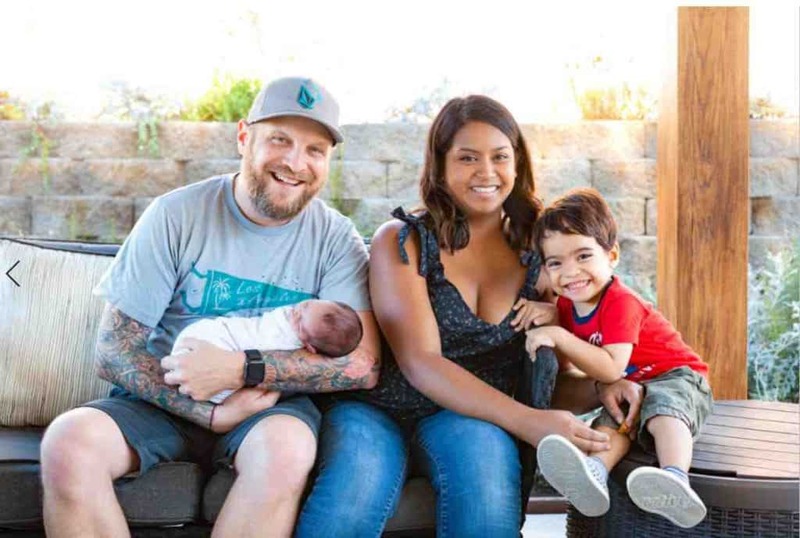 The fact that it is compatible with car seats made by several other manufacturers enables parents to create a complete travel system without splurging. Check car seat compatibility chart. 1) Hard to steer when fully loaded. Ride is decent but not as comfortable as double strollers that have all wheel suspension. 2) A few squeaks and rattles here and there. Overall, The Sit and Stand Ultra by Baby Trend offers a lots of seating options. It appeals to a wide range of buyers due to its ease of use and affordability. International Shipping also available. 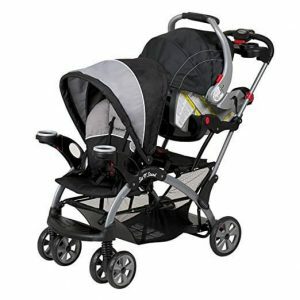 The fourth model on our list of double strollers is the Sit N Stand Ultra. Just like the other two Baby Trend double strollers above, this model too offers a great combination of practicality and affordability. This Model can accommodate two kids weighing up to 50 pounds each. They both can either be strapped into the removable seats or the rear seat can be removed to expose the Sit N Stand setup – a padded jump seat and a footrest. The older child can either sit on the jump seat or stand on the footrest...just like mom and dad. This model can also accommodate car seats that are sold separately by Baby Trend. Other brands’ car seats may also be compatible. Please confirm because making a purchase – you might just end up saving a few $$$. Baby Trend has provided a car seat compatibility chart. 1) Foot brake and five-point seat belts ensure adequate safety. Both seats have overhead canopies to shield against harsh sunshine. 2) Removable and adjustable child-tray makes feeding easy. Cup-holders are ideal for milk or juices. The parent gets a separate closed tray with two cup-holders. This is great for keeping your mobile phone, coffee etc. 3) In all models, front wheels are the first thing that comes into contact with bumps and other obstacles. This usually causes this model to jerk and makes the ride hard and unpleasant. However, the Sit n Stand Ultra has front wheel suspension. This helps to absorb most of the shocks and enables your kids to have a happy and comfortable ride. 4) Older Children can also sit in the front seat as the child tray swings away to make more room. 1) Not very maneuverable when loaded to the maximum. You will require a fair amount of strength to make it turn. This is not a problem if your children are smaller/younger. 2) Ride is not the smoothest despite the presence of a front suspension. Can handle the occasional small patch of grass and gravel but definitely not meant for off-roading. 3) Rear jump-seat has no back-rest. Not comfortable for long walks. Also, good luck getting your toddler to stand on the footrest without him/her trying to jump out! Baby Trend is definitely trending when it comes to double strollers! The Sit N Stand 2x Carbon offers an unmatched blend of convenience and practicality at a budget friendly price. This model is perfect for twins or for two children of same or slightly different ages. It features two heavy duty seats that can each accommodate a child weighing up to 50 pounds. The carrying capacity of this is the highest in its class. Thus, you can put together a complete travel solution without spending too much. 2) This model has a large storage basket for stuff such as diaper bags, toys etc. However, being a dad, I know that it is highly inconvenient to carry drinks (milk, juice, health tonics, coffee etc.) in the storage compartment. You have to keep bending over and reaching into the bag every time you want to take a sip. Sure, you can simply hold the drink in your hand. Maneuvering a 100+ pound beast with only one hand is not everybody’s cup of tea! This model deals with the problem by providing not just one or two but five cup holders. Parents get a separate covered tray with two cup holders. This tray can be used to keep change, treats, keys etc. It is well thought-out features like these that make an outing with kids stress-free and enjoyable. 3) This model comes with a foot break, sun canopies and 5 point safety harnesses to ensure that the kids are always safe, snug and secure. 4) Front wheel suspension filters out hard bumps. 5) Many models are not suitable for infants. This is not the case with this Baby Trend model. It works for babies only days old to older children (all the way up to 50 pounds). In short, you get an astounding return on your investment! 6) Despite being a bigger model, this model is fairly easy to fold and is narrow enough to through doors. 2) Not available outside the USA. 3) Ride is not the best, although definitely not the worst either. 4) Squeaks and rattles may develop overtime. Rear bench lacks proper back-rest. This model is not flawless but nevertheless, it’s a very good model with a killer price tag! 6th on our list of Double Strollers is the Graco Ready2Grow. *Slaps the hood* This bad boy offers 12 riding options and serves a variety of purposes. It has two conventional seats set in a compact inline arrangement. The rear seat faces the parent and facilitates more face-time with infants. It can also be removed to reveal a bench seat and a standing platform for slightly older children. 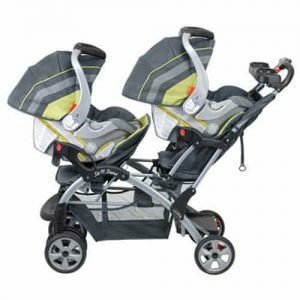 Unlike other double strollers where the older child is compelled to stand or sit (on the bench seat) in a backward facing position, this one allows for both forward and parent facing sitting and standing positions. The foot platform, front seat and the rear bench seat can hold a child weighing up to 50 pounds. The rear seat can hold up to 40 pounds. This model is compatible with one or two Graco Snugride Infant car seats, which are the best-selling infant car seats in the USA. 1) The front seat is has recline adjust and can lie almost flat for infants’ comfort. Both front and rear seats have 3 and 5 point safety harnesses. 2) The swivel front wheels and lockable and help to steer a fully loaded one with relative ease. 2) Parent tray with a swivel cup-holder and a large storage basket help in making the ride hassle-free and enjoyable. 3) Folds easily with one hand and locks automatically. You need to get the hang of how to do this right but once you become familiar – it is fairly quick and straightforward. 4) Overhead guards to protect against Sun-rays and dust. Front suspension facilitates a smoother ride. 5) As the name suggests, it's ready to grow. It is suitable from infant-hood all the way up to 40-50 pounds. 1) Rear face-time seat does not recline. 2) Average overall fit and finish. Ride is not great despite the front suspension. 3) A little bulky when folded. Takes up most of the trunk of a Subaru Outback. It's designed to serve your family faithfully for a number of years. No wonder the Grace ReadytoGrow Click Connect LX is one of the most popular in the country. International shipping is also available. 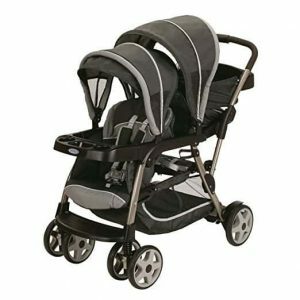 Coming in 7th on our double strollers list is this model by Chicco Cortina. At first glance, the Chicco Cortina 2Gether looks contemporary and stylish which is not a surprise as it is an Italian design (some of you probably guessed this owing to the exotic moniker). However, this bad boy is not just about form, it’s quite functional too. It can be converted into a full-fledged travel kit by attaching Chicco Car seats. The model is compatible with two Chicco Keyfeat 30 car seat models. 1) Each seat can hold up to 40 pounds. The rear seat reclines fully for accommodating the car seat or bassinet. The front seat folds forward when you wish to attach the car seat. This means that there’s still enough room left for the child sitting in the rear. 2) The adjustable canopies protect against dust, debris and the Sun. The canopies form a cosy, comforting, cocooning enclosure in conjunction with the car seats. This enables infants to relax and if you’re lucky, they might even sleep for a little bit and allow you to rest. 3) Lightweight yet durable aluminum construction with yarn-died fabric. The push handle has three 3 positions and parents also get their own tray with two cup holders and a storage area. 4) Comes with convenient one touch breaks and folds quickly and safely with just one hand. Stands on its own even when folded. No need to hold it upright. 5) Large storage basket with zip. The children’s grab bar is interchangeable with cup holders. This makes feeding easy. 6) All wheel suspension ensures a smooth and comfortable ride for kids. Front locking swivel wheels make this one relatively easier to maneuver. Not much really. The model is light thanks to the aluminum tubing but it’s not the most compact model around. Does occupy a fair bit of space even when folded. Also, there are no child trays. The Chicco Cortina Together is a good looking, comfortable and well engineered machine. This is a premium product with a lot of attention to detail. If you value quality, then the Cortina is definitely the one to pick. 2) Both seats can hold a child up to 50 pounds and 42 inches tall. 3) The seats come with sun canopies and can be set to multiple recline positions. 5 point safety harnesses provide a snug and safe ride. 4) Large storage area and parent tray with dual cup holder. 5) Convenient and effective rear foot break ensures that this model stays in place even on inclines and uneven ground. 6) Fold-Trigger facilitates folding in one quick and easy motion. The rear wheels are removable and hence account for a more compact fold. 1) No child tray or cup holders. 2) Cannot accommodate car seats. 3) The seats have a side-by-side stadium configuration. This makes it wide. (Width is 31.5 inches). 4) Bicycle air tires are great for comfort and steering but you may have an occasional flat. 5) Suitable for kids aged 6 months and above. Not infant friendly. 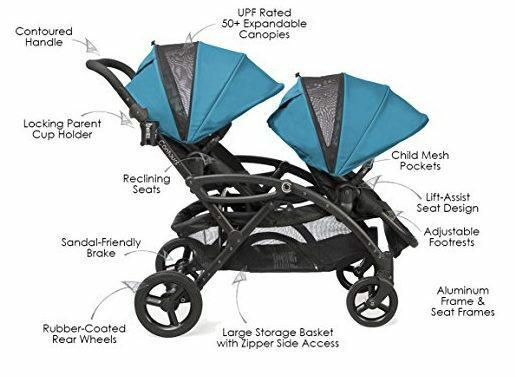 Compared to other 'feature full' Double Strollers, It DOES have a few limitations but it is a great ‘niche’ product for those who like to stay on the move. 1) Strong yet lightweight aluminum tubing frame weighs only 34 pounds. 2) Each seat can take up to 40 pounds and has adjustable footrests. It is equipped with a lift assist mechanism for easy seat removal. 3) The rear break is sandal-friendly and easy to engage. It also comes with extendable mesh sun canopies, peek-a-boo windows, cup holder and a large storage basket which can be accessed via a side zipper. 4) Contoured handle makes this model easy to push and steer. Rubber coated wheels and all wheel suspension ensure a soft, comfortable ride for the little ones. 5) Easy to fold and carry. Quick-disconnect wheels help to save space during storage. Folds even while both seats are still attached. Stands on its own. 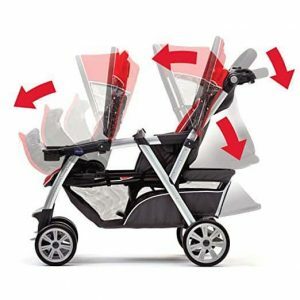 1) Does not have child-trays or cup holders, this is definitely somethin we like to see featured in double strollers as it comes in VERY handy. 2) Slightly expensive. Somewhat bulky. Overall, This model has a plush ride and offers lots of seating arrangements and safety features. A child-tray would have made it near-perfect. 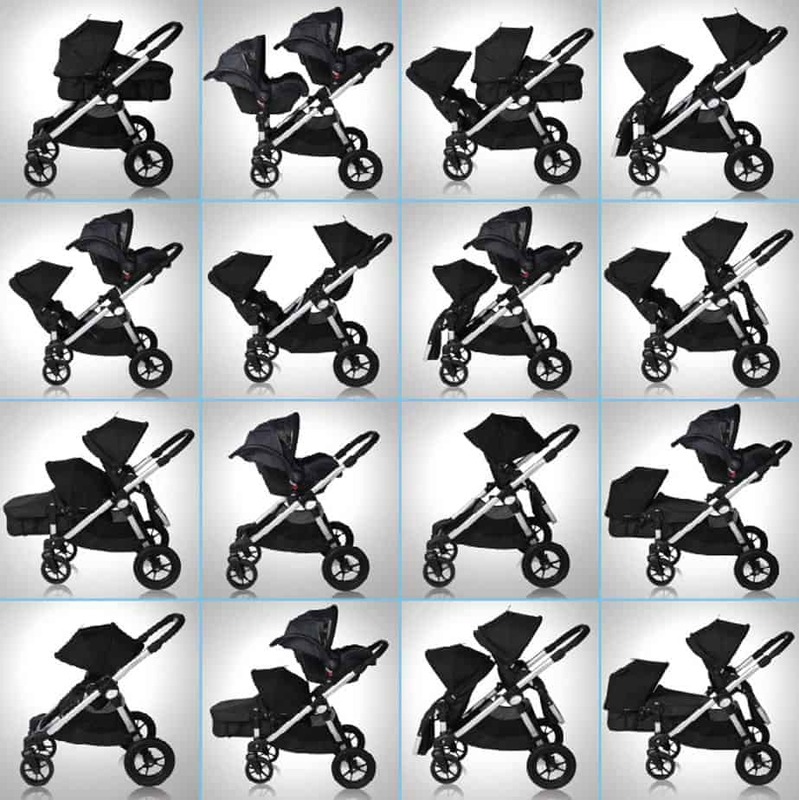 Which Double Stroller do YOU prefer? I hope you enjoyed reading through the list of double strollers. Which one did you like the most and why? Please post your opinions in the comments section so that parents and caregivers from all over the world may benefit from your insights and experiences. I’m curious to hear your thoughts on why you rated the Baby Trend Sit and Stand one place higher than the Baby Trend Sit and Stand Ultra tandem. I’m contemplating these strollers and was wondering what the differences are and what made one superior to the other! As you see, they’re #2 and #3 on the list and both very highly rated. The Sit and Stand has 4.2 Stars on Amazon, the Ultra Tandem has 4 stars on Amazon. Copyright text 2019 by SnugBaby.net.